Commentary by yours truly, on broadcast and print media, about the Commission on Judicial Nomination's list and Gov. Andrew Cuomo's possible selection, is available below. Some of the news stories, of course, contain commentary by others as well. The New York Law Journal article, by John Caher and Joel Stashenko, is particularly comprehensive and provides a good sketch of each of the individuals on the Commission's list. Fred Dicker: Live from the State Capitol! Governor Cuomo will soon fill two vacancies in the NYS Court of Appeals and, if elected to a second term in 2014, will also appoint the remaining five members, as each current judge will reach retirement age or the end of his or her 14-year term. Earlier today, Albany Law School Professor Dr. Vincent Martin Bonventre discussed the topic in depth on TALK 1300's Fred Dicker Show. http://www.talk1300.com/CMT/podcast/FREDPODCASTDEC172012.mp3 --from the 29:15 minute:second mark. Albany, NY, Aug 13, 2012 — In the next couple of years, Governor Andrew Cuomo may have the chance to shape the state's highest court, the Court of Appeals, as several judges reach the end of their terms or the mandatory retirement age. It's an opportunity no New York governor has had in a generation. Between now and 2017, the terms of all of the seven judges on the state’s highest court will expire. Most will have reached the age of 70 by then, the mandatory retirement age for the court. The first is Carmen Beauchamp Ciparik, the first Hispanic appointed to the court back in 1994, who turns 70 later this year. If Governor Andrew Cuomo wins re election in 2014 and stays the entire term, he will be able to completely overhaul the court, if he wants. Vince Bonventre is an Albany Law School Professor and court expert. He says court watchers will be eagerly awaiting the governor’s first choice for clues. “Who is he going to appoint? How many checkmarks is he going have on this appointment?” Bonventre asks. “Or won’t he care at all? Will he just look at the list and say ‘well, I think this individual will be an absolutely fabulous juror’”. It was Andrew Cuomo’s father, Mario Cuomo, who last had the opportunity to completely rebuild the court. Bonventre says Mario Cuomo drew from both major political parties, including former Chief Judge Sol Wachtler, a Republican. He named Judith Kaye as chief Judge to succeed Wachtler, the first woman to hold that position. Mario Cuomo also appointed the first Hispanic, Ciparik, and the first African American to the court. “He really diversified the court,” Bonventre said. Governor George Pataki chose judges who more closely hewed to his conservative , law and order, ideology. Susan Read was one of the governor’s top counsels, and Vicky Graffeo was the solicitor general under Pataki ally, Attorney General Dennis Vacco. One appointment was his roommate when Pataki served in the Assembly, and another was a major campaign contributor. So far, Governor Andrew Cuomo seems to be following in the spirit of his father Mario Cuomo rather than the tradition of George Pataki. The search commission to find a list of candidates to replace Ciparik is chaired by former Chief Judge Kaye, who has encouraged non-politically connected but qualified lawyers to apply. Kaye has even extended the application deadline and made presentations to the New York City Bar Association to drum up more candidates. Governor Andrew Cuomo’s next chance to choose a judge for the court will be in 2014, when Pataki pick Graffeo’s term will be up. Graffeo will not be 70, though and Cuomo could choose to simply reappoint her to another term. Bonventre says whether Cuomo decides to replace the more conservative Graffeo with a new choice will be telling, and reveal whether the governor really wants to put his stamp on the court. Ciparik’s replacement is not likely to change the balance of the court. But if Graffeo were replaced with a less conservative judge, then the court would shift from four conservative judges in the majority to four moderate to liberal judges. And there is precedence for doing that. Former Governor Pataki did not reappoint George Bundy Smith, the only African American on the court, when his term was up, and instead appointed Eugene Pigott, to solidify a conservative edge on the court. That change perhaps allowed Pataki to score a victory in a struggle for power with the legislature over the state budget, when the governor won in case known as Pataki v Silver. ALBANY -- Gov. Andrew Cuomo next month will choose a replacement for retiring Court of Appeals Judge Carmen Ciparick from among seven candidates recommended to him. And soon after,he'll have to make a second appointment to the state's highest court. The Commission on Judicial Nomination submitted a list Dec. 1 of four women and three men to the Democratic governor to fill Ciparick's post on the court. Cuomo has from Jan. 1 and Jan. 15 to make his choice. His recommendation then goes to the state Senate for confirmation, and the Senate has 30 days to confirm or reject the appointment. The Court of Appeals has seven members. "We have a few weeks and we are going through the list," Cuomo said to reporters during a cabinet meeting Wednesday. The six candidates who are not chosen by the governor will be considered for the vacancy left by Associate Judge Theodore Jones, of New City, Rockland County, who passed away Nov. 6. The deadline for individuals to apply for Jones' seat is Dec. 18. For Ciparick's seat, a panel led by former Chief Judge Judith Kaye nominated Sheila Abdus-Salaam, Rolando Acosta, Kathy Chin, Eugene Fahey, Jenny Rivera, Margarita Rosa and David Schulz. They were chosen from a list of 75 individuals, which is a record number of applicants for a Court of Appeals seat, court officials said. Ciparick was the court's first Hispanic judge and served for 19 years. She has to retire at age 70, effective Dec. 31. Candidates Acosta, Rivera and Rosa are of Hispanic decent. The commission said one of the factors considered to fill the vacancy is a diversity of applicants. Jones, appointed in 2007, was the only black judge on the court. "We added the factor of diversity, and by diversity we don't just mean race and ethnicity but also background and where in the law they have been practicing," Kaye said. Of the 75 applicants, 47 percent were women and 32 percent were ethnic minorities. The commission said it interviewed 36 candidates before choosing the final seven, and half of them were minorities. Abdus-Salaam and Acosta are associate justices in New York City. Fahey is an associate justice from Buffalo and the only upstate candidate. The other four candidates are also from New York City. "We encourage a diversity of applicants, and we had applicants from every part of the state," Kaye said. "It just happened to turn out that six of the seven candidates chosen are from New York City. "In 2007 and 2008, there were only 15 and 17 applicants for two vacant positions, respectively. The commission said they enhanced their outreach efforts through increased public announcements and meetings. Applicants had until August 15 to apply for Ciparick's vacancy. "We had a big statewide search and we are now into our second round with the Judge Jones vacancy," Kaye said. "We are giving everybody a chance out of those 74 remaining applicants. We are also expecting additional people to apply for the vacancy. "Cuomo, if elected to a second term in 2014, would be able to appoint all seven members of the court during his tenure. 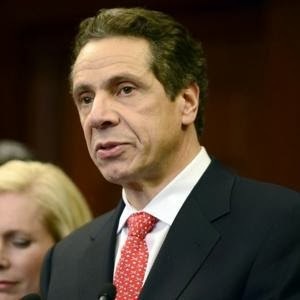 The other five members would either reach retirement age or the end of their 14-year terms during Cuomo's second term, said Vincent Bonventre, an Albany Law School professor who follows the court. Bonventre said former Gov. George Pataki, a Republican, added conservative-leaning judges during his three terms from 1993 through 2006. Pataki's predecessor, Democrat Mario Cuomo, and the current governor's father, appointed judges with a mix of views, Bonventre said. "Is he going to be like Pataki and stick with his own ideology and own party, or is he going to be pick from both sides of the ideology and partisan line?" Bonventre said of the current governor. "He's going to have plenty of opportunity. "More immediately, Cuomo will have to fill seats held by two minority judges who had been among three liberal judges on the court; the other being Chief Judge Jonathan Lippman, Bonventre said. Bonventre said the list of finalists are all Democrats who "if you look at their activities they appear all to be liberal." He said that, "Obviously there is going to be pressure upon the governor to replace Ciparick with a Hispanic. She was the first Hispanic on the court, and to replace Judge Jones with an African American. "People who want to apply for the Judge Jones vacancy can download an application form from the Commission's website at www.nysegov.com/cjn. Applicants can also choose the option to be considered for future vacancies. ALBANY — The state’s top court is on its way to becoming the Cuomo Court. If he wins and serves a second term, Gov. Cuomo will be able to replace all seven members of the state’s Court of Appeals. The only other New York governor who has completely remade the court since its judges became appointed rather than elected in the late 1970s was Mario Cuomo, the current governor’s father. Since four of the court’s current six judges were appointed by Republican George Pataki, Democrat Cuomo has a chance to change the court’s direction. But Albany Law School professor Vincent Bonventre said Cuomo hasn’t shown much of an ideological hand in his nominations. If he’s like his dad, he won’t stick to just liberal Democratic appointments,” said Bonventre. “His dad appointed as many Republicans as Democrats and as many conservatives as liberals. “Certainly, he’s been interested in diversity, like his dad was,” Bonventre added, noting that the younger Cuomo made Randall Eng the state’s first Asian-American presiding judge for the Appellate Division, one step below the Court of Appeals. Governor Andrew Cuomo was always going to have a chance to make an impact on the Court of Appeals, the state's highest bench. That's because Judge Carmen Beauchamp Ciparick—a liberal appointed by Mario Cuomo in 1993 who was the first Hispanic judge on the court—is being forced out this year after turning 70, the mandatory retirement age, and Cuomo is to choose a successor from a list of recommended candidates. But now the governor has two seats to fill on the seven-seat court, following the death of Judge Theodore Jones, an Eliot Spitzer appointee who died of a heart attack in November at age 68. The candidates for Ciparick's seat will be chosen by the governor from a list of seven finalists chosen by New York’s Commission on Judicial Nomination, which will have until March 7 to give Cuomo another list of contenders for the Jones seat. At the moment, the Court of Appeals is divided between four Republican appointees of former Gov. George Pataki and two Democratic judges, with one vacancy due to Jones’ death. In pure partisan terms, Cuomo won't be able to make the court any more Democratic, since he'll be replacing two Democrats. His choice, essentially, will be between strengthening a Republican majority that tends to be tougher on criminal defendants and civil plaintiffs than the minority Democrats, or recreating a situation in which a liberal minority can prevail in divisive cases by attracting support from one of the Pataki appointees. For his first appointment to replace Ciparick, Cuomo must choose from a list of finalists—six who hail from New York City and one from Erie County—who have run as Democrats in judicial elections, served in Democratic administrations and donated to Democratic candidates. While similar in partisan affiliation, the group is diverse in terms of gender (four women), ethnicity (five non-white) and legal talent (two private-practice attorneys, three appellate justices, a CUNY law professor and a nonprofit leader). The backgrounds of some of these finalists suggest that they have an understanding of the legal issues that low-income, disabled or minority New Yorkers face in the court system. For instance, the list includes Margarita Rosa, executive director of the Grand Street Settlement who was Mario Cuomo’s human rights commissioner; Justice Rolando Acosta, an appellate judge who authored a ruling that said board members of the famed Dakota co-op could be held liable for racial discrimination; and Kathy Chin, a health care and real estate attorney in private practice who serves on the New York City Commission to Combat Police Corruption. Mario Cuomo, who reshaped the appeals bench in his time as governor, offered his insight into the selection process at a June meeting of the 12-member judicial nominating panel, which is headed by former chief judge Judith Kaye. As is often the case when he talks about his own experiences, the comments seemed to offer some insight into some of the factors his son (and former top political aide) will be taking into account. Mario Cuomo made 11 appointments during his three terms—the most of any governor—because he came into office soon after voters ditched elections for Court of Appeals judges for a merit-based selection process, which started in 1979. Among the more noticeable changes during the elder Cuomo's tenure was the court’s gender and race makeup. The court saw its first Hispanic and, in Kaye and Ciparick, female judges during that time, and the first appointment of an African-American judge to a full term. Though he was himself a liberal and proudly partisan Democrat, the former governor tried to pull talent equally from both parties, or, in one instance, from no party at all, tapping the independent Judge Joseph Bellacosa. None of the governor’s successors have picked a judge from the opposing party. Vin Bonventre, a professor at Albany Law School and a close watcher of the state’s judiciary, said both Cuomos understand the Court of Appeals’ power and influence, and the practical implications of the court's working philosophy on criminal-justice and economic matters. Bonventre also noted that the court influenced the early legal careers of both Cuomos: Mario, fresh out of law school, was a clerk for a Court of Appeals judge; Andrew Cuomo, who cut his teeth in law as a prosecutor in Manhattan, is an Albany Law School graduate, Class of 1982. Cuomo’s eventual nominees, who must receive confirmation from the State Senate, will have a hand in rulings that can drastically alter the litigation climate for businesses in New York. In the coming years, the Court of Appeals may opt to address major legal questions arising from the mortgage crisis and economic meltdown. And last year, the Court of Appeals issued a landmark ruling settling a standoff between Wall Street giants and investors over the scope of the Martin Act, the state’s powerful financial fraud law, a decision that opened the door for investors—like unions’ hefty pension funds—to file common-law negligence suits against banks over the alleged peddling of shoddy mortgage-backed securities. Obscure opinions on insurance law can take on huge significance after disasters like Superstorm Sandy. Take, for instance, a ruling from 2008 that said policyholders could sue their insurance provider for the “consequential damages” of denying a claim in bad faith. So far, Cuomo has made eight picks for the appellate division, which is effectively a farm team for New York’s high court. The appointments—all Democrats—included Justice Karen Peters, who became the first woman to preside over an influential appeals court department that covers the Capital Region, and Justice Randall Eng, a Queens judge who is the first Asian-American presiding justice in the state. Cuomo’s six other appellate appointees were elected judges pulled from the trial court, as state law dictates. Professionally, they have had experience as prosecutors, criminal defenders and government lawyers, as well as attorneys who worked at the Legal Aid Society and DC37, New York City’s largest public-employee union. Mario Cuomo, in discussing the Ciparick vacancy over the summer, said he was pleased at his son's nonpartisan approach. Nonetheless, there is going to be pressure on Cuomo to appoint a person of color now that the bench lost Ciparick and Jones. Without them, the court would be all white and would have just two women. Black leaders in 2006 criticized Pataki for declining to reappoint Judge George Bundy Smith, the only African American on the high court at the time, to another 14-year term. Bundy Smith said a high court vacancy is an opportunity for Cuomo to counter the image that his inner circle and administration lacks voices from people of color. Legal observers I spoke to agreed that changes made to the search process this year are attracting fresh faces to the talent pool. The search process is more public, the daunting application has been whittled down to a brief four-page questionnaire and a 500-word essay, and there is a greater push to gin up interest among lawyers in academia, private practice and in-house corporate counsel. This year, there were 75 applications for the Court of Appeals vacancy—shattering the previous record of 47 applicants in 2006, according to a record of nominations dating back to 1997. Since that year, the nomination process for Ciparick’s open seat saw the most candidates advance to the interview stage and the level of diversity reached its highest point. ALBANY - A Commission on Judicial Nomination headed by a former chief judge and counseled by two former clerks of the Court of Appeals has produced what observers say is not only the most diverse group of high court nominees ever, but a list of exceptionally qualified candidates. On Dec. 1, the commission chaired by former Chief Judge Judith Kaye presented Governor Andrew Cuomo with a list of seven judges and attorneys from which he must select the next Court of Appeals judge. Six of the seven have Ivy League credentials. Three are Appellate Division justices. One is a well-known First Amendment lawyer. Another is a law professor. One is a partner at a large firm. One nominee runs a major human services agency. "What can you complain about with this list?" asked Vincent Bonventre, an Albany Law School professor and veteran court watcher who has complained about plenty of lists in the past. "If you want people with judicial experience, you've got it. If you want diversity, you've got it. If you want women, you've got it. From their educational background to their career experience, it is a very strong list and different kind of list." Other Experience: Elected as Supreme Court justice, 1993, reelected in 2007; Civil Court judge, 1992-1993; general counsel, New York City Office of Labor Services, 1988-1991; assistant state attorney general, 1980-1988; staff attorney, Brooklyn Legal Services, 1977-1980. Education: B.A., 1974, Barnard College, 1974; J.D., 1977, Columbia Law School. Personal: Democrat; lives in Manhattan. Other Experience: Elected as Supreme Court justice, 2002; acting Supreme Court justice, 2001-2002; elected as Civil Court judge, 1997; first deputy commissioner, deputy commissioner, New York City Commission on Human Rights, 1988-1993; New York City Legal Aid Society, 1982-1988 and 1994-1997. Education: B.A., 1979, Columbia University; J.D., 1982, Columbia Law School. Personal: Democrat, lives in Manhattan. Immigrated from the Dominican Republic at age 14. Other Experience: Member, New York City Commission to Combat Police Corruption, 2003-present; member, New York City Planning Commission, 1995-2001. Education: B.A., 1975, Princeton University; J.D., 1980, Columbia Law School. Personal: Democrat, lives in Manhattan. Married to Judge Denny Chin, U.S. Court of Appeals for the Second Circuit. Other Experience: Elected as Supreme Court justice, 1996, reelected in 2010; Buffalo City Court judge 1994-1996; house counsel, Kemper Insurance Co., 1985-1994; law clerk to Court of Claims Judge Edgar NeMoyer, 1984; member, Buffalo Common Council, 1978-1984 and 1988-1994. Education: B.A., 1974, SUNY Buffalo, 1974; J.D., 1984, SUNY Buffalo Law School; M.A., 1998. SUNY Buffalo. Personal: Democrat, lives in Buffalo. Other Experience: Founder, director, Center on Latino and Latina Rights and Equity at CUNY Law, 2008-present; special deputy attorney general for civil rights, 2007-2008; commissioner, New York City Commission on Human Rights, 2002-2007; clerk for then-Southern District Judge Sonia Sotomayor, 1993-1994; administrative law judge, New York Commission of Human Rights, 1992-1993; associate counsel, Puerto Rican Legal Defense and Education Fund, 1988-1992; counsel, Legal Aid Society's Homeless Family Rights Project, 1987-1988; law clerk, Second Circuit's pro se law clerk's office, 1985-1987. Personal: Democrat, lives in the Bronx. Other Experience: Commissioner, New York State Division of Human Rights, 1990-1995; executive deputy commissioner, New York State Division of Human Rights, 1988-1990; general counsel, Division of Human Rights, 1985-1988; associate, Rabinowitz, Boudin, Standard, Krinsky & Lieberman, 1981-1984; staff attorney, Puerto Rican Legal Defense and Education Fund, 1979-1981; attorney, Rosenman & Colin, 1977-1979. Personal: Democrat, lives in Manhattan. Other Experience: Lecturer, Yale Law School, 2009-present; lecturer, Columbia Law School, 2006-present; attorney, Rogers & Wells and Clifford Chance, 1978-2003; counsel, John Anderson for President, 1980. Education: B.A., 1974, Knox College; M.A., 1976, Yale University; J.D., 1978, Yale Law School. The panel delivered to Cuomo what is undeniably the most diverse list ever from which he will select the successor to Judge Carmen Beauchamp Ciparick, the first Hispanic judge on the high court. If Cuomo wants to replace Ciparick with a Hispanic, he has three choices. If he wants to replace her with a Hispanic woman, he has that option. He could appoint the first openly gay member of the court (David Schulz) or the first Asian-American (Kathy Chin). The one thing all seven have in common is they are all, like Cuomo, Democrats. Bonventre said the list represents not only diversity but quality. "What strikes you at first glance is the diversity," Bonventre said. "But when you go beyond the names and look at the bios, this is a very, very impressive list. They are really accomplished people." Victor Kovner, a partner at Davis Wright Tremaine and former chairman of the Fund for Modern Courts, said the strong list is a testament to the merit selection process. He said that with the list Cuomo can't go wrong. "I think this is a distinguished list of candidates and I am sure the governor will make an outstanding choice," Kovner said. "We have been blessed in this state with the merit selection system for choosing judges of the Court of Appeals and this is just another occasion where we can feel confident we will have an outstanding new member of our highest court." Senator John Bonacic, R-Mount Hope, chairman of the Judiciary Committee, said all the candidates "appear to have impressive backgrounds. I look forward to meeting with whichever one the governor nominates. I don't want to otherwise pre-judge any of them." Cuomo has between Jan. 1 and Jan. 15 to submit the name of one of the nominees to the state Senate for confirmation. He must choose from the list. The Senate has 30 days after receiving the nomination to confirm or reject his choice. The Commission on Judicial Nomination is a 12-member panel with unpaid appointees of the governor, chief judge and legislative leaders. It is currently chaired by Kaye, now of counsel to Skadden, Arps, Slate, Meagher & Flom, and advised by two former Court of Appeals clerks: counsel Stephen Younger, a partner at Patterson Belknap Webb & Tyler who clerked for Court of Appeals Judge Hugh Jones, and deputy counsel John Halloran, a partner at Speiser Krause who clerked for Court of Appeals Judge Matthew Jasen. The panel sought out qualified candidates, holding events in Albany, Rochester and New York City to encourage applications for the Ciparick opening. It also conducted outreach through bar groups, community groups and law schools. The effort paid off with the highest number of applications (75), female applicants (35) and minority applicants (24). "I am very pleased with the process," Kaye said yesterday. "I think the process worked extremely well. We got an unprecedented number of applicants, which pleases me very much and an unprecedented number of qualified applicants." While the commission sought applicants from diverse racial, religious, ethnic and geographic backgrounds, Kaye said diversity was not the No. 1 consideration of commission members. "We have quality first on our list," she said. According to the former chief judge, her years on the Court of Appeals gave her additional insight about the court and she said she found herself weighing in the evaluation process "how that person would fit and how they would maintain the high quality of the Court of Appeals." Kaye said the "stellar" and "superbly qualified" nature of the applicants for the Ciparick opening will make the pool of candidates to fill another vacancy all the stronger. The commission is accepting applications until Dec. 18 for a position vacated by the recent death of Judge Theodore Jones Jr. Kaye anticipates that most, if not all, of the applicants for the Ciparick seat will be considered for the Jones opening. The position pays $177,000 annually. Applications are available atwww.nysegov.com/cjn. Carey Dunne, president of the New York City Bar, said the commission produced a list that is both "good and diverse." Dunne said the City Bar is evaluating the candidates and will release its ratings by Dec. 21. Rivera, Schulz and Abdus-Salaam declined to discuss the application process in detail, except to say that Kaye was welcoming and put them at ease during the interviews. "She is so people-friendly that it reduces the tension level in the room," Schulz said. Rivera said she was "just very honored and thrilled to be on the list. It is quite an accomplished list of people." |John Caher can be reached at jcaher@alm.com. Joel Stashenko can be reached at jstashenko@alm.com.